When treating solid tumors, the best way to tell if therapy is on track is from the molecular insight into the metabolic or proliferative activity of the tumor provided by PET/CT scans. However, most payers limit the number of PET/CT scans that will be reimbursed. Other treatment response measurements (CT, MRI, palpation) don’t provide the most timely feedback. They measure size, a trailing indicator of the tumor’s response to therapy. Lucerno’s investigational technology requires minimal radiation and is intended to let the clinician know early in the treatment cycle if the tumor is responding. If it is, stay the course. If not, consider other treatments. Good for the patient, the oncologist, and the payer. Lucerno's system gives molecular insight. PET/CT scans provide a snapshot in time of molecular insight by capturing the positron emissions from injected radiotracers. These scans are a primary tool for pre-therapy staging of a patient’s cancer. Based on the tracer’s mechanism of action, molecular imaging measures the metabolic or proliferative condition of cancer cells by capturing the tracer emissions. Molecular imaging is also rapidly becoming the most advanced tool for oncologists and researchers to monitor tumor response to treatment. Lucerno’s investigational technology also provides molecular insight over time. This kinetic measurement of the uptake of radiotracers is done quickly, easily, and inexpensively. It is intended to provide oncologists with insight into how cancer cells are responding to treatment. It can be hard to get time course uptake in PET without taking a scanner for an hour or more to do dynamic imaging. This works for a few research studies, but is hard to do in practice. On the other hand, in standard practice we really don’t get any temporal data – just static uptake measures. I could envision having patients with superficial tumors have time course data during the uptake period for a PET scan, where the [Lucerno] device uptake curve could get calibrated to the PET scan value and give full time course data for the tumor. 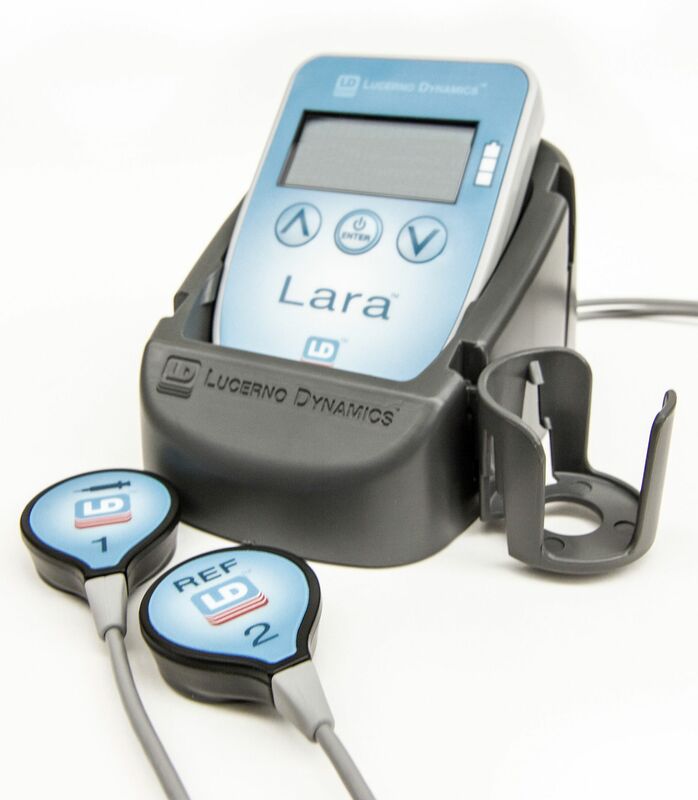 The Lucerno Lara System is currently used under an investigational device exemption for therapy response. It uses surface sensors to measure the radiation emitted from an area of interest. One sensor for the tumor, one sensor for each bicep, and one for another location of interest (secondary tumor, liver, etc.). The system is completely passive–it emits no energy. A baseline Lucerno scan is done at the same time as staging PET/CT scan. The sensors are applied prior to radiotracer injection, and collect dynamic uptake data from four target areas during the pre-PET uptake waiting period. 2-3 minutes of extra work, and no extra radiation. In clinical studies, Lucerno scans have been done early and frequently in the treatment process to evaluate the systems’ ability to assess tumor response to therapy. A standalone Lucerno scan (without PET scan) requires a very low dose of radiotracer and does not require the CT scan and the associated additional dose of radiation. The results are available within minutes of the completed scan. The Lucerno graph to the right is from a neoadjuvant breast cancer patient in an investigational study. A Lucerno scan early in therapy showed the metabolic activity of the tumor area of interest had been greatly reduced. Upper black line is baseline scan, pre-therapy. Lower black line is follow-up scan, after 2 cycles of therapy. Green line shows injection arm sensor result. Area Under the Curve (AUC) change of -25% between the 2 black lines indicates the area of interest is less metabolically active. Her tumor was excised 7 months after the follow up scan. The pathology report showed complete response. The Lucerno graph to the left is from another neoadjuvant breast cancer patient in an investigational study. A Lucerno scan early in therapy showed the metabolic activity of the tumor area of interest was stable or had slightly increased. Upper black line is follow-up scan, after 2 cycles of therapy. Lower black line is baseline scan, pre-therapy. Red line shows injection arm sensor result. AUC change of +6.8% indicates the area of interest is likely more metabolically active. Unfortunately, therapy was not successful for this patient. Would you like to incorporate LD technology into a study? You can reach us at info@lucernodynamics.com. and are limited by United States law to Investigational Use.